I'd like to introduce Arcterra RP. Arcterra RP has grown from a passion of mine, to full blown project. My history includes the better part of a decade of RP experience on a variety of platforms (WoW RP-PSs, TESO etc), as well as 5 years of community management and leadership (within said RP communities, as well as gaming clans and the likes). It's absolutely gutting that WS was shutdown, but that has given rise to private server development, of which Arcterra RP is. That is to say, that I don't want people squirrelled away on housing plots where their RP is limited. Let's have the full immersion, let's have a full, dedicated server to just RPing! However please understand that. This is not the full WS experience in terms of abilities, levelling, quests in the MMO sense. This is a dedicated RPing server which will utilise text based emotes, this will be a functioning eco-system that your character will interact with. If you want to buy a house, your character will need to have money. How will they get the cash? Things like this will be important in Arcterra. We have updated our road map, which can be used as a guide to what we, as a team, will be working on in order to set up the server. It goes without saying that the information here is subject to change at a moments notice, and whilst everything may look good on paper, application may be a whole new ball game. Having everything set up on Discord will be a our first port of call. This simply a cheap way for us to house the Arcterra Community, without having to pay for forum upkeep. Keeping costs down is a priority at the moment. This is hosted on the AEGIS Discord, and has become their project also. Our wikia is our main source in regards to lore. This is an on-going project, but we are currently in the process of archiving all information we can get in regards to Wildstar, and adapting it for our server. When in an acceptable form and mostly padded out, our wikia can be used to refer to in regards to understanding the ever growing story of Arcterra. This is simply the design of most systems that you will use. For example, how is money going to be transferred? What commands do you have access to? If I want to build a house, is that something I can do or do I have to get someone else to build it for me? How do I get permission to do X, Y or Z? - These will be designed and documented, then implemented into the community (hopefully) seamlessly. Eventually, we will be setting up a forum dedicated to Arcterra. This will hold a host of resources, information and where the most OOC activity should be based. It will be where you apply for housing / characters etc, and in short - will act as a normal forum should. As it stands, the forums are very nearly finished, however there is an upkeep cost of $9 every month, which may not seem like a lot, however this is still something that needs funding, and we do not expect our community to fund something when they are not getting anything in return. As such, we have plans to complete the forum, and then take it offline until such a time comes where it is required. That is, unless the community would like to use the forum, in which case funding will be required. Moderators, administrators, developers - whatever we end up branding our staff roles with, will be allocated on a case-by-case basis. More than anything, demand will be the motivator for deciding whether more / less staff are needed. More on this soon™. We have decided on some names and various roles, but these are subject to change. You can find these on the #staff-body channel in our Discord. Development will begin once we have access to the Arctium WS source. Sadly, we cannot do anything before this. As it stands (29th November 2018) - We have access to the server files and are now making plans to schedule development soon™. Whilst the Arctium Source should be in a working state, we have our own plans for the server and as such, we need to make sure that everything will working (hopefully) smoothly for “release”. As such, we will be hosting an “Alpha Test” where the server will be opened, mainly to stress test, as well as a variety of other developer things. It also gives you an idea of what the server will (hopefully) be like! Depending on a number of factors, the server will either be kept up, or brought down until a time that it is ready for launch. We will need a certain amount of money to sustain the server every month. We are looking to have internal infrastructure in place, however we will rely on community donations to maintain upkeep and simply put, it will be down to whether or not the community is behind the server as to whether or not it will be sustained. Of course we will be doing what we can, but it is a joint effort. In terms of the roadmap, the project is coming along rather well. We have been hard at work on a lot of things. There will be restrictions initially, but this is a journey for all of us. I don't know if anyone still uses this site, but if you're reading this please feel free to drop by our Discord. I like this idea. If you ever want to discuss RP, I'd be good for it. 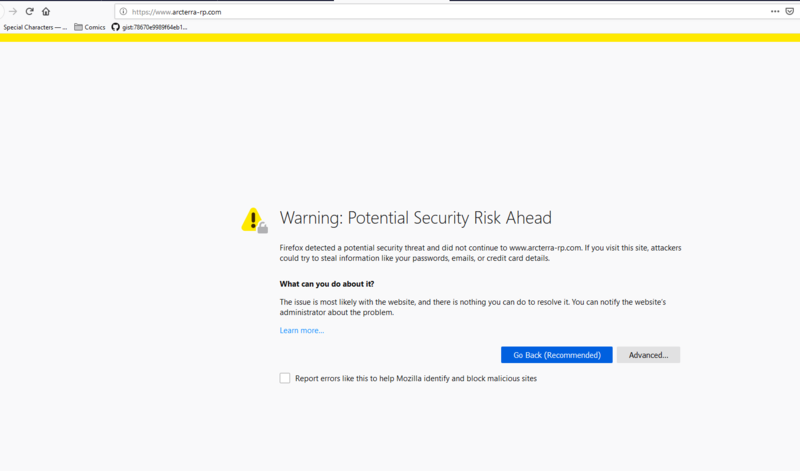 You should be made aware that firefox is blocking me from entering that site- looks like you have some significant security risks and need to work on that before opening it up to the public. That's because I shut it down - probably should've checked that out first, hey?